moving shadow in the egg which is the yolk floating about in the white. In fresh eggs the yolk is small and in the centre of the egg. The chalazae (kal-Lay-zuh) / (umbilical cords), the twisted cord-like strands of egg white that anchor the yolk in the centre of the white, would be less prominent and weaker, allowing the yolk to move off centre. If you hard boil an old egg, you can quite clearly see the air cell indentation in the top of the egg. When you cut along this hard boiled egg lengthways you will see that the yolk has moved off centre. A quick test for freshness is to check if the raw egg in the shell sinks in a bowl of cold fresh unsalted water. Fresh eggs stay at the bottom of the bowl. An egg can float in water when its air cell has enlarged sufficient to keep it buoyant. This means the egg is old, but it may be perfectly safe to use. Crack the egg into a bowl and examine it for an off-odour or unusable appearance before deciding to use or discard it. Other factors such as a weak shell and fine cracks may also cause the egg to float. 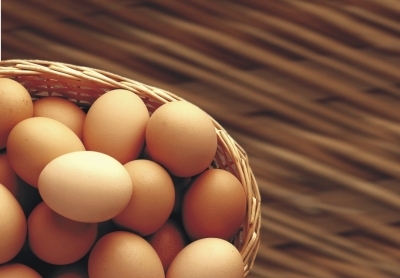 Good quality fresh eggs display certain characteristics when broken out. The yolk is small and rounded and stands high in a thick, gel-like egg white which tends to stay compact rather than spread out over a wide area. As eggs age, the yolk becomes thin and runny. By this time the egg will also have developed a stale odour and flavour.